Skin is the outer-most tissue of the human body. As a result, people are very aware of, and very sensitive to, the appearance of their skin. Consequently, skin appearance has been a subject of great interest in various fields of science and technology. In particular, research on skin appearance has been intensely pursued in the fields of computer graphics, computer vision, cosmetology and medicine. In the field of computer graphics, computational modeling of the appearance of skin is today considered to be a very important topic. Skin appearance models are widely used to render fictional human characters in movies, commercials and video games. For these "virtual actors" to appear realistic and be seamlessly integrated into a scene, it is crucial that their skin appearance accurately captures all the subtleties of actual human skin under various viewing and lighting conditions. Although great progress has been made in making rendered skin appear realistic, rendered skin is still far from perfect and is easily recognized as being rendered rather than real. In short, a computationally efficient and yet realistic skin model remains an open problem in computer graphics. In computer vision, a detailed and accurate model of skin appearance is of great value in identifying individuals. For instance, human identification based on fingerprints has made substantial progress and is now a widely used biometric technology. It is now widely acknowledged that accurate models of the appearance of skin in other parts of the body could be useful for human identification as well. For instance, technologies that recognize the pattern of blood vessels in the palm and the finger have been recently developed and have shown high performance in identification. In order to reliably exploit similar signatures of skin appearance from other body regions, we need a more comprehensive understanding of the visual characteristics of skin. Skin is also of aesthetic relevance. The desire to have beautiful and healthy looking skin has always been a quest for humans. Making skin appear beautiful is the primary goal of cosmetology. For instance, foundations are widely used to hide skin imperfections and make skin look younger. Despite the enormous investments made in skin research, today's foundations are far from perfect. While they may hide imperfections and made skin appear more uniform, the final appearance of skin coated with a foundation always has an artificial look to it. Recently, skin counseling systems have been developed to help a person identify cosmetic products that would be most suited to them. Such systems can also benefit from more accurate models of skin appearance. Needless to say, the appearance of skin is of vital importance to the field of medicine. During the diagnosis of skin diseases, careful observation and assessment of the appearance of the diseased area is always the first and most important step. Recently, photo-diagnosis and photo-therapy have become popular methods for treating skin diseases. In these techniques, light is used to detect and treat lesions in the skin. Such approaches are non-invasive and hence patients are not subjected to pain and scars during the treatment. In order to increase the precision of such systems, we need more precise models of the interaction of light with dermal tissues. In this project, we have surveyed the most prominent results related to skin in the above fields and shown how these seemingly disconnected studies are related to one another. In each of the above fields, the optical behaviors of specific skin components have been studied from the viewpoint of the specific objectives of the field. However, the different components of skin produce different types of optical phenomena that are determined by their physio-anatomical characteristics (sizes, shapes and functions of the components). The final appearance of skin has contributions from complex optical interactions of many different skin components with light. In order to view these interactions in a unified manner, we have described and categorized past works based on the physiological and anatomical characteristics of the various skin components. "The Appearance of Human Skin: A Survey,"
Foundations and Trends in Computer Graphics and Vision, Vol. 3, No. 1, pp. 1-95, Jan. 2007. "The Appearance of Human Skin,"
The components of skin appearance can be hierarchically categorized along an axis that represents physical scale. Each scale may include several levels of detail. Components at each level produce a different physical phenomenon. These physical phenomena can be described in terms of appearance or scattering models. 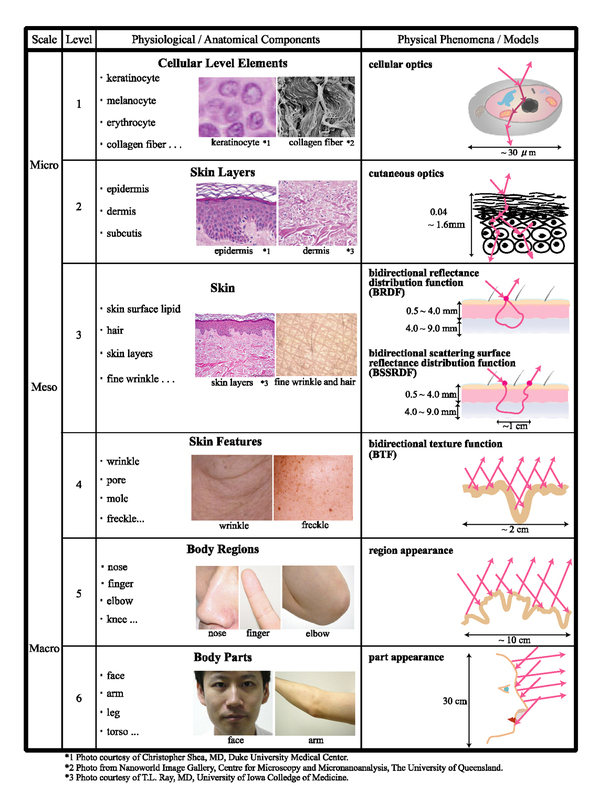 Our survey uses this taxonomy to review the studies of skin appearance done in different fields. We describe the physio-anatomy of each component as well as the physical phenomenon it produces.